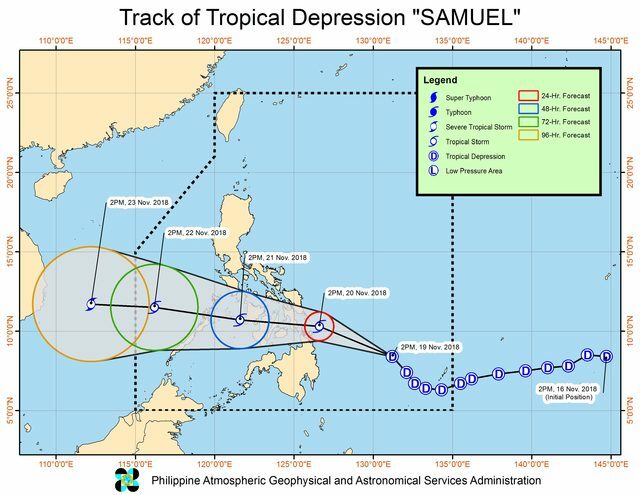 The Philippine state weather bureau has urged people not to take Tropical Depression Samuel lightly, as it is expected to intensify into a tropical storm. In a press briefing at 5 pm today (Monday, November 19), the Philippine Atmospheric, Geophysical, and Astronomical Services Administration (PAGASA) said Samuel was moving towards the Philippines and gathering speed. The tropical depression continues to have maximum winds of 55 km/h and gustiness of up to 65 km/h. But it is expected to strengthen within the next 24 hours. Samuel is expected to make landfall in the Eastern Visayas-Caraga area tomorrow afternoon or evening. PAGASA warned that moderate to heavy rain may trigger flash floods and landslides in Caraga, Eastern Visayas, Central Visayas, Negros Occidental, Davao Oriental, Compostela Valley, Bukidnon, Misamis Oriental and Camiguin. PAGASA Administrator Vicente Malano also emphasised that while winds may not be very fierce, the intense rain expected could bring hazards. “That’s why we’re issuing warnings. We’ve given flood advisories especially in the Visayas, Caraga and Northern Mindanao,” he said. Classes have been suspended in parts of the Visayas and Mindanao for tomorrow. Thousands of travellers remain stranded at sea ports across the central Philippines, and fishermen have been warned to stay ashore. If Samuel maintains its speed, it will exit the Philippine Area of Responsibility at some time between Thursday evening and Friday morning. Samuel is the Philippines’ 19th tropical cyclone for 2018. The country is hit by an average of 20 per year.